Simply Enter your details to download our free guide to reaching Basecamp! Ever since Nepal first opened its borders to outsiders in the 1950s, this tiny mountain nation has had an irresistible mystical allure for travellers. Today, legions of trekkers are drawn to the Himalaya’s most iconic and accessible hiking, some of the world’s best, with rugged trails to Everest, the Annapurnas and beyond. Nowhere else can you trek for days or even weeks in incredible mountain scenery, secure in the knowledge that a hot meal, cosy lodge and warm slice of apple pie await you at the end of the day. Nepal is nirvana for mountain lovers. The Everest Base Camp trek is the perfect way to see the breathtaking beauty of the Himalayas at their best – and to see Mount Everest in person. On the first day, we depart from UK and fly to arrive in Kathmandu. Today is a free day in Kathmandu. Explore the bustling streets of Thamel, head to a tea house, eat freshly-cooked momos or visit one of many Buddhist temples around the city at your leisure. After flying to Lukla, we will start the trek, setting off for a gentle walk to Phakding, a further 3 hours to the North. The trail leads through Lukla, past hotels, shops on to the edge of the Lukla plateau where the trail drops to meet the intersection of the Jiri trail at Chablung. From here the trail follows the Dudh Kosi north through the village of Ghat and then finally to Phakding for the overnight stay. The trail heads beside the Dudh Kosi and continues upstream along the banks to the confluence of the Bhote Kosi and Dudh Kosi. After crossing the large suspension bridge, the trail starts ascending through pine tree forests to reach the distinctive horse-shoe shaped bowl village of Namche Bazar where we will stop overnight. Today will be a rest day for acclimatization. Namache is famous for it’s market, so offers some brilliant opportunities to discover the local produce and culture. If you rise early, those who go for a climb to the ridge above Namche will be rewarded with the stunning dawn and sunrise over the panorama of the Khumbu peaks. Today we will steadily descend to the Imja river. We will then climb steadily for about 2 hours to Thyangboche Monastery, one of the most beautiful places in the world. Today we will Trek up the Imja river valley to Pangboche where we will be given the opportunity to visit the Monastery. After lunch, the Trek will take us through to the village of Dingboche. Today is another rest and acclimatization day at Dingboche. Today the aim is to trek around the base of the Khumbu glacier and have a light lunch at Dhugla, before a steep climb to Lobuche village. Today we trek to Everest Base Camp. Once we reach the camp and have taken our time to take in the amazing atmosphere and surrounding views of EBC, we trek for another 15 minuted to Dingboche for lunch. The afternoon consists of 2-hour trek to reach Chhukung. We trek from Lobuche to Thyangboche, passing spectacular meadows and scenery of Everest and Ama Dablam. Trek from Thyanboche to Khumjung (3790m). Trek from Phakding to Lukla (2800m). After an early breakfast at the lodge, we fly back to Kathmandu and transfer to the hotel. Today is a free day to explore Kathmandu at your leisure. Today we head to the airport for our return flights back to the UK. No experience is needed, however we strongly recommend you practice and train well. You will require a reasonable amount of fitness and a strong will to succeed. Remember that you are walking between 4 and 8 hours a day, uphill to an altitude of 5300m. or 5 payments at £470.00Book today! or 11 payments at £224.55Book today! or 17 payments at £145.29Book today! or 23 payments at £113.00Book today! or 24 payments at £108.29Book today! or 29 payments at £89.62Book today! 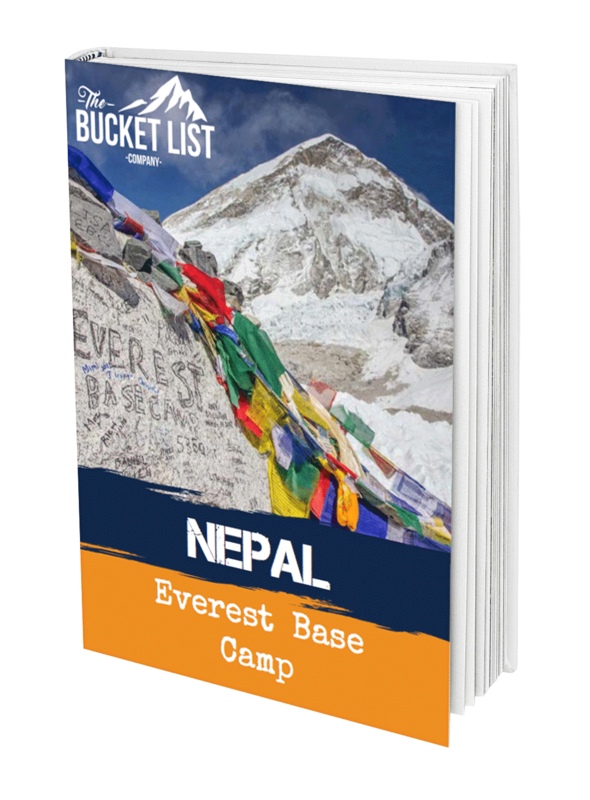 Interested in finding out more about our Everest Base Camp Trek, Nepal adventure?